With the objective to continue raising awareness, "Sowing the Seeds" is presented to the minors on the care of habitat, species and conservation of natural resources. 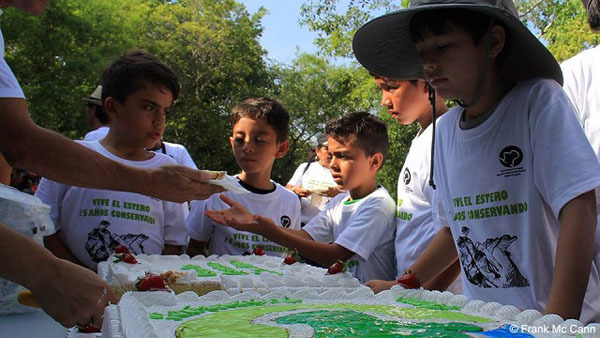 On April 30, "Children's Day", the Estuary El Salado will be giving free boat rides and tours through Puerto Vallarta's environmentally protected area to the children, an ecotourism tour that will start at 9:00 in the morning and continue throughout the day. This celebration is dedicated to the children with the aim that more of our youth have the opportunity to enjoy this tour in the estuary. They must be accompanied by an adult and should have a previous reservation, announced Jaime Torres, Biologist and Director of the Estero Salado. "You can make a reservation for one or two children, but they must be accompanied by an adult (without cost). The normal tour lasts about 1 hour 50 minutes, but to offer the opportunity for more children to experience the tours, they will be a little shorter but will contain the same quality." They are expected to perform about 7 or 8 tours, with the participation of about 120 people, adults and children, as permitted by the time quota. Note that if can not attend that day, the Estero El Salado offers different educational and promotional packages where schools and groups can take the tour. The normal cost for an adult is 100 pesos and for children is 50 pesos for those who reside in Puerto Vallarta. For visitors, the rate is 300 pesos for adults and 100 pesos for children. To celebrate Children's Day in the Estuary, please reserve your space by cellular telephone at 044-322-201-7361 or 044-322-175-7539.